Hand-filled sacks of potatoes are seen near the Snake River Canyon rim in this early Clarence E. Bisbee photo. The crop yielded 446 bushels to the acre. The tuber that made the state famous traveled a long way from its roots to get to the United States and eventually to Idaho. Peru was home to potatoes some 7,000 to 10,000 years ago. First grown by the Incas, the nutritious member of the nightshade family found its way to Europe via Spanish conquistadors. It’s said Sir Walter Raleigh introduced potatoes to Ireland in the 16th century, but the crop never got a good start in England. Potatoes made their way back to the Americas in the 17th century and first took root in New England. A potato blight knocked out much of the European crop in the 1840s — the resulting famine hit Ireland especially hard. Many, including Mormon converts from the United Kingdom, escaped the famine by immigrating to America. 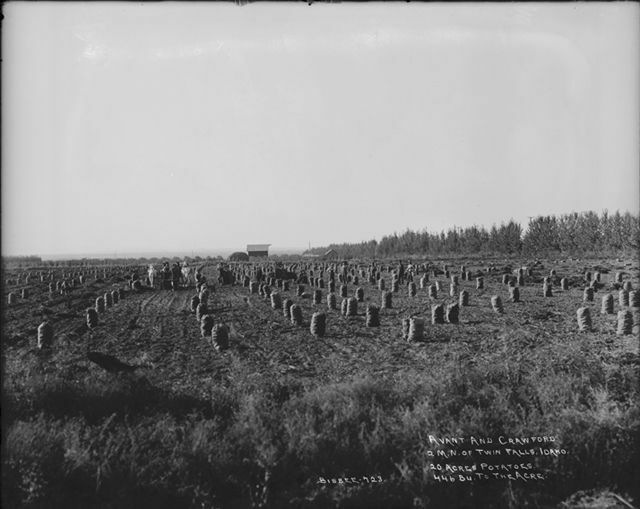 In 1860, three years before Idaho Territory was established, Mormon colonists from the Salt Lake Valley — thinking they were still in Utah — moved into what is now Franklin County, bringing potatoes with them. Today, Idaho is the largest producer of potatoes in the United States. Mychel Matthews reports on rural issues for the Times-News. The Hidden History feature runs every Thursday in the Times-News and at Magicvalley.com. If you have a question about something that may have historical significance, email Matthews at mmatthews@magicvalley.com or call her at 208-735-3233. A gunfight in 1916 sent one man to jail and a Rogerson homesteader to the hospital with a smashed hip bone.